From Bethlehem to Milan to bring hope in education. “As educators, we must first of all bring hope. If educatorshave no hope, and therefore do not bring any into their work, all our work is useless “. From this intuition of Don Antonio Mazzi the association Educators Without Borders (ESF) and Exodus together with the Association pro Terra Sancta organized a week of training for 13 teachers and educators from Bethlehem in Milan. The group of teachers was led by Fr. Marwan, head of the Casa del Fanciullo (Children’s home) and director of Terra Sancta College in Bethlehem. 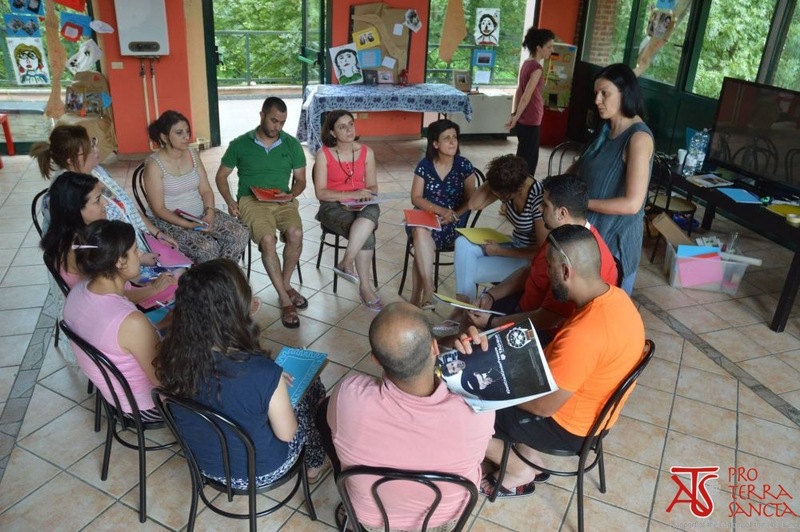 “The teachers from Bethlehem expected a training made up of lectures – says Gabriella Ballarini, coordinator of ESF training – with methods and recipes to use in teaching once they were home. But this is not what education is about. We were not interested in presenting ourselves as ‘experts’ who impose more or less adequate methodologies, but we wanted rather to start a journey together, as fellow travelers, towards self-knowledge“. Initially this approach has left the teachers of Bethlehem schools a bit perplexed, but then the “pedagogy of hope” turned out to be a very important discovery to carry out their work in a context such as that of the Palestinian town, where the constant tension and socio-political conditions cause depression, and very little confidence in future opportunities. “The group activities – Gabriella states – aimed at showing the teachers how the work as educators, coincides with the knowledge of ourselves. Therefore we need to go ove all our alibis that oprevent us from hoping, in order to be able to teach. In their case, for example, the separation wall that closes up the city was a really strong alibi, but together we discovered that this wall can be overcome by working on itself and on the conception that one has of oneself “. To explain the origin of the initiative, we must start from the love of Don Mazzi for the Holy Places. “I have always wanted to do something in the Holy Land” says the Veronese priest, “because in our educational journey, in addition to the pedagogical intuition of Educators Without Borders and Exodus which is very particular, we want to go deeper and deeper into the knowledge of the Gospel, to discover the history of God with men – therefore not just the Gospel, but the whole Bible – in a physical way. This is why we want to go to the Holy Land “. The first meeting between Educators Without Borders with Bethlehem teachers has already aroused a lot of curiosity in the Bethlehemites who can not wait to work together again following this “pedagogy of the journey and hope” to the discovery of education, a type of education that changes their heart and self-consciousness, that goes beyond the walls, the one that can really help in the process of building a small town that struggles to believe in the future.